Both West and East Ham Labour met up today at Green Street in a sea of red for a final stall with our Parliamentary candidates, Lyn Brown & Stephen Timms. Life time Labour supporter, 92 year old Second World War hero, Ron Higgins, who survived 32 missions as a gunner on Lancaster Bombers (the average lifespan for aircrew was only 20 missions) came with his family to show support. Ron in his youth also played for West Ham and Leyton Orient FC and later was a trade union convenor in the docks. We worked out he first voted in a General election in 1945. He remembers Will Thorne, the founder of the GMB and local MP until 1945. Stratford & New Town Candidate, Charlene Mclean (& beautiful baby) was also there to leaflet and talk to residents. 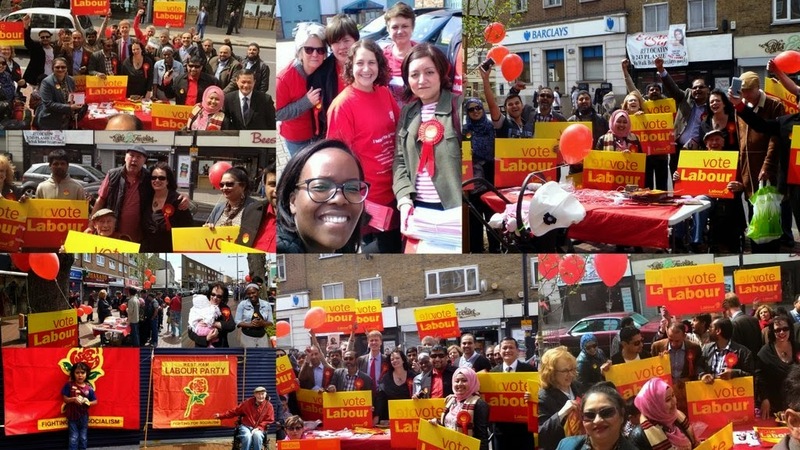 Newham Women's Forum were out supporting Suzy Stride in marginal Harlow and after the stall finished activists went out to door knock in Stratford and Ilford North.